Gogeous handcrafted stitch markers, from the sublime Rose Quartz to the whimsical rubber 'bumpers'. 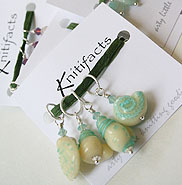 Great additions to your knitting accessory collection, and wonderful gifts! 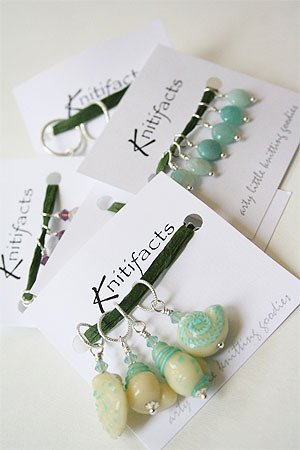 Knitifacts produces these whimsical stitchmarkers for passionate knitters who like to spice up their projects with something functional. 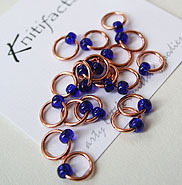 From the fanciful Shell stitch markers of blown glass, to the small but delightful 'ringlets', these little pieces will add a smile to your project. 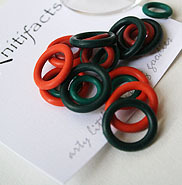 They make wonderful gifts, and are a delight to work with. We even just leave them in, sometimes!